It was December 2000 and this was the first time we had visited New York. 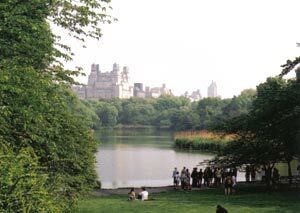 Since it was business, we didn't have much time so Central Park seemed the best place to visit – easy to walk to anyway. Outside the park we had only Common Starling and Feral Pigeon. 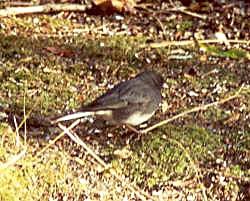 We entered the park at the south-east corner expecting to see Dark-eyed Juncos hopping around everywhere. House Sparrows was all we saw. Not deterred we walked up the 5th Avenue side of the park, then crossed onto the Mall and to Bethesda Terrace where we checked The Lake. Again we were disappointed, seeing only Mallards. Still believing there must be decent birds somewhere we headed along the east side of The Lake. A scan across the water finally yielded a proper American bird – American Robin – a bird we thought would have migrated south by now. Near this bird we found a male House Finch, then a female. Just north of the eastern arm of The Lake things improved further with a White-throated Sparrow and our first ever Tufted Titmouse. We heard Blue Jay calling and a Great Black-backed Gull (ABA list tick) flew overhead. We walked up the road, getting another lifer in the form of a splendid Red-bellied Woodpecker, and into the woods fortunately heading into The Ramble. This is the best place for birds we found, mainly because there are feeders here. As we got near the feeders we found our first Northern Cardinal. A spot of fairly aimless wandering took us to the feeders where we sat and just admired the birdlife. Here we had many House Finches, a few American Goldfinches, Tufted Titmice, Blue Jay, White-throated Sparrows, House Sparrows, and scruffy-looking Red-winged Blackbirds. A flock of about six Mourning Doves flew in soon followed by a Downy Woodpecker. Dark-eyed Juncos fed on the path and a fabulous Red-bellied Woodpecker fed within a couple of metres of us. Surprisingly, a Ruby-crowned Kinglet fed above us in the trees. We expected Golden-crowned, not Ruby-crowned. Once things had calmed down and the bird numbers had decreased we headed south towards The Lake. Dark-eyed Juncos and White-throated Sparrows were common and we soon found two excellent (Red) Fox Sparrows feeding with the White-throated Sparrows. A Northern Flicker called loudly and flew overhead, showing its yellow 'shafts' well, and landed in a nearby tree. 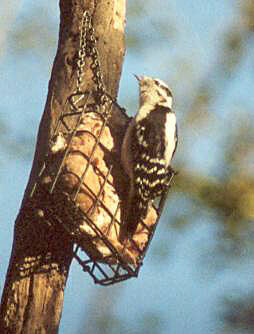 A Hairy Woodpecker put in a very brief appearance, then disappeared off into the woods. A very pale Red-tailed Hawk circled overhead soon followed by a darker bird and American Crows could be heard calling. Across 79th Street we came to Turtle Pond, a small lake with Mallards, a male Wood Duck, Canada Geese and an American Coot. (American) Herring Gulls and Ring-billed Gulls flew overhead. Finally, we headed towards Cedar Hill and 5th Avenue. The Long-eared Owl in the pines on Cedar Hill was not to be found and we later heard it had not been seen for a few days. However, we had an unexpected bird nearby in the form of a Hermit Thush, showing the rufous tail and drooped, flicking wing posture. The next day, Sunday, was colder than Saturday, about 0°C out of the wind, and a lot colder in the wind. However, the sky was clear and the wind mostly light and conditions for birding were good. This was a longer trip than yesterday and we saw more birds, although no more lifers. This time, knowing where we were going, headed straight for The Ramble. On the way we found the two Red-tailed Hawks sitting in trees about the paths. The feeders in The Ramble were a lot quieter this time and within minutes we had met a couple of birders who took us off to Turtle Lake. Here, as well as yesterday's male Wood Duck and American Coot we had a female Wood Duck, a male Ring-necked Duck and a female Hooded Merganser. Back at the feeders the House Finches were about as were American Goldfinches, Red-winged Blackbirds, a nice and close Downy Woodpecker, a few Mourning Doves, Dark-eyed Juncos, White-throated Sparrows and a Hermit Thrush. We headed to the western arm of The Lake, getting Northen Cardinal and a single Fox Sparrow, and found a flock of about 30 Northern Shoveler feeding in a very tight group on the water. Also here were a few Ruddy Duck and about 20 Ring-billed Gulls. 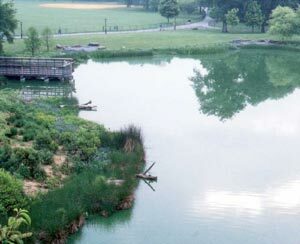 Next stop was The Reservoir, the largest body of water in the park. This is split into two sections by a causeway down it's centre. Our first birds were three male Buffleheads and then one female. The far side of the water held a lot of gulls and ducks so we headed round there. The ducks were mainly Mallards with the occassional Ruddy Duck and a pair of Canavasbacks. The cluster of gulls at the north end of the causeway comprised mainly Ring-billed Gulls, the occassional (American) Herring Gull and a few Great Black-backed Gulls. There were also a few American Crows walking amongst the gull flock. On the water near the fence was a single Pied-billed Grebe. The walk back to The Ramble was quiet with the only bird of note being a Northern Flicker. Back in The Ramble we found a mixed flock feeding amongst the fallen leaves. This comprised about six White-throated Sparrows, at least four Dark-eyed Juncos, one male Northern Cardinal, a single Fox Sparrow and our first-for-the-trip Song Sparrow.